As if by amazing serendipity, I had just started writing this when I read Carly Z’s “Adventures in Internet Radio” talking about traveling with Pandora and Slacker. Don’t get me wrong, there are plenty of reasons to love these apps! Loads of music, tons of choices, affinity selection with ‘learning’ system that allows you to help the apps do their job better. In fact, since before Christmas not a week has gone by that we haven’t used either Slacker or Pandora on either my Droid or iPod Touch to play music for the whole family, and when my younger son bought himself an iPod Touch those apps were amongst the first he added. But over the last week two categories of problems with those services have really frustrated my family. First, a little on how they work: both Slacker and Pandora allow you to choose from a variety of presets, but most folks will want to search for specific artists or songs. The apps use these searches more as ‘guidance’ than as a specific request, so if you want to hear Ke$ha’s Tik Tok (my younger son loves that) you will probably get a Ke$ha song right away, then listen to some music of a similar style, and fairly soon get to Tik Tok. The heart of these sites is the so-called ‘Music Genome Project’, that uses 29 degrees of compatibility … errm, no … 400 musical attributes in order to thread together a playlist that should include music that will generally satisfy the desires of the person entering the search item. And as I said, generally it works fine, with each of my kids finding new music this way, and the whole family enjoying this sort of random playlist. As I alluded to earlier, entering a song into Slacker or Pandora doesn’t mean that song will come up first on your playlist. This can be frustrating if you really want to hear a particular song, but generally you get the right artist and the song you want often arrives pretty quickly. And if you ask most folks, they will tell you that these apps are not the place to go to hear a certain song *right now*. The question is – how long should it take for you to hear the song you searched for? Particularly when it is the most popular and iconic song by the artist, and you searched for – and it indicated it found – that very song and created a station around it? 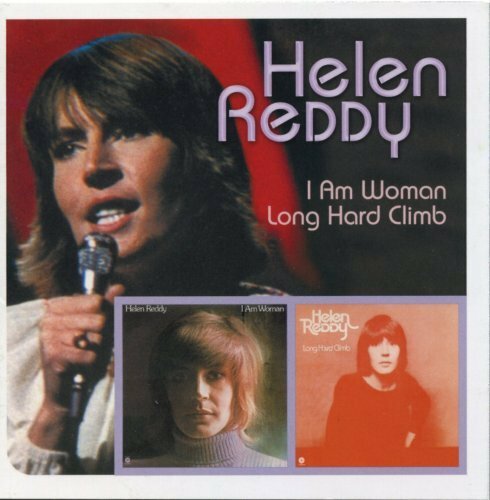 As you might have guessed the song in question was Helen Reddy’s 1972 feminist anthem ‘I Am Woman’. My wife happened to say off-hand to the kids ‘I am woman hear me roar’ (something to do with living in an all-male house, I am sure), and the two of us started singing the song as we were working on a puzzle. And no, I don’t want to discuss what that says about my status as an old fogey that I can instantly break out into singing a nearly 40 year old song that I grew up with! So I grabbed my Droid, popped open Slacker and entered ‘Helen Reddy I Am Woman’, and we listened to Reddy sing Angie Baby, some Carly Simon, Anne Murray, Carole King, Neil Diamond, Barry Manilow, and more … with Helen Reddy sprinkled in ever 3 or 4 songs for the first couple of dozen. Yet in ~50 songs I am Woman never came up in the playlist. After a couple of hours, I switched to Pandora, and heard a similar set of songs, and forwarded through several of the ones that we had already heard (and ones that were best left back in the 70’s). About an hour into that we abandoned hope for the night. I know what you are thinking – ‘dude … 99 cents on iTunes’! But isn’t the purpose of these apps supposed to be hearing stuff in a radio-like setting so that you don’t have to buy the song just to hear it once? All through last week we would try again with different permutations, and heard loads of great singer-songwriters of the 70’s … but never I Am Woman. I estimate that we listened to over 250 songs between the two apps on both my Droid and iPod Touch, with me constantly ‘heart-ing’ Helen Reddy’ in a desperate attempt to get the song to come up later in the week. So on Sunday I just bought the song, we listened to it a couple of songs, and I asked my wife ‘do you want it on your iPod’? She said ‘no, I just wanted to hear it … I’m good for probably a year or two’. As I said, I fully understand the ‘not for a specific song’ thing, but to go over 250 songs with loads of other songs from the same record playing, and not hear THE MOST POPULAR song from an artist? That is just ridiculous! Anytime I talk about ‘music intelligence’ sites such as Apple’s genius, Last.fm, and so on, I generally refer to them as ‘useless for my music’. This includes Slacker and Pandora. The reason is pretty simple – these services do data mining of one type or other, and need to populate their neural network knowledge systems with SOMETHING. In the case of popular music, you are looking at hundreds of thousands of sales of anything in the ‘top 100’, and that list changes on a weekly basis. The amount of purchasing / listening relationship data is tremendous. But when I am able to easily buy a collector’s edition CD set from a 1000-copy run two years after release, and as my article on Jason Parker showed he was counting CD sales by the tens of sales, there is much less data to correlate. Particularly since many of these avant-garde artists tend to use alternative means to distribute music and therefore wouldn’t be counted – or perhaps even available. I started with 70’s fusion group Return to Forever, which led to Weather Report and Herbie Hancock’s Headhunters (all fusion), then to Chick Corea’s early solo piano work, to Wayne Shorter (from Weather Report) and then to ‘Flamenco Sketches’ from Kind of Blue. Albert Ayler led to Ornette Coleman …Dexter Gordon isn’t as surprising in terms of time-frame or style, but unlike many others they weren’t side-men for each other. The others came from vastly different styles of jazz and led to the iconic modal masterpiece. I know it makes sense because Kind of Blue is the biggest selling jazz recording of all time, but since these ‘genomes’ are supposed to keep you well constrained in terms of similarity it makes little sense – and makes it difficult to attempt to create any consistent mood other than ‘sort of between hard bop and Kind of Blue’.To put it into context I also started with John Zorn (who never played with Miles, nor was he in a group with anyone who played with Miles) and ended up at So What from Kind of Blue seven songs later … and here are videos of the starting and ending song … remember, this happened within *7* songs! You be the judge … am I really expecting too much out of these internet radio apps?